Germany Lotto 6 aus 49 offers jackpots from €1 million and up to its current record of €45.4 million! Choose six numbers from a 1-49 pool and an additional number to purchase your official German Lotto ticket. Draws take place every Wednesday and Saturday. The German Lotto, known as the ‘Lottery 6 aus 49’ has been available to play since 1974. 6 aus 49 is very popular in Germany and also in Europe to play. This is one of the olders lotteries in the world. How to play “6 aus 49”? How to Play the German Lotto. You have to select a number from a pool of 1 -49 and a bonus ball between 1-9. Perhaps you find choosing 6 numbers quite difficult. It definitely helps when you think about your favorite number. Besides random and manual selection, it’s also possible to save your lucky numbers. For example, you could buy a systematic form with lucky numbers like 9, 10 and 11.Hopefully they’ll bring you a lot of money during the German Lotto draws at Wednesday at 17.00 GMT and Saturday at 18.00 GMT. How much is a online ticket? The ticket price online for 6 Lines is € 15.00. This is € 2,50 for each line. If you want to play more as lotto only. Please select the additional lotteries you would like to participate in. You can use the ticket number to see which 6 or 7-digit number you are participating in the respective additional lottery. Participation is only possible in connection with the main game LOTTO 6aus49. The games Spiel 77 and Super 6 will be played on Wednesdays and Saturdays. The Ausspielung the luck spiral takes place only on Saturday. Obviously, the German Lotto Jackpot is the absolute top prize. It’s worth millions of euros, and still has a record breaking Jackpot of 45.4 million. It already exists since 2007, so in the past 10 years there hasn’t been a hit. Maybe you will be the person that has the matching six numbers and Super numbers? The second prize is great as well. If a player has a ticket with six main numbers he or she will win the second prize of hundreds of thousands of euros! The systematic form, already mentioned, could boost your win even more. The Lotto is organized all over the world. Germany is one of the European countries that offers some very nice Jackpots. You can win huge amounts of money, from 1 million to a record breaking 45.4 million euros! This is not the only reason for the popularity of Lotto. It’s also a very easy game to participate in. The only thing you need to do is pick six numbers from a range of 1 to 49, and an additional number known as the Super Number. In that case you have to choose between 0 and 9 to win extra money. German Lotto multi-draw. The German Lotto sells different types of tickets. 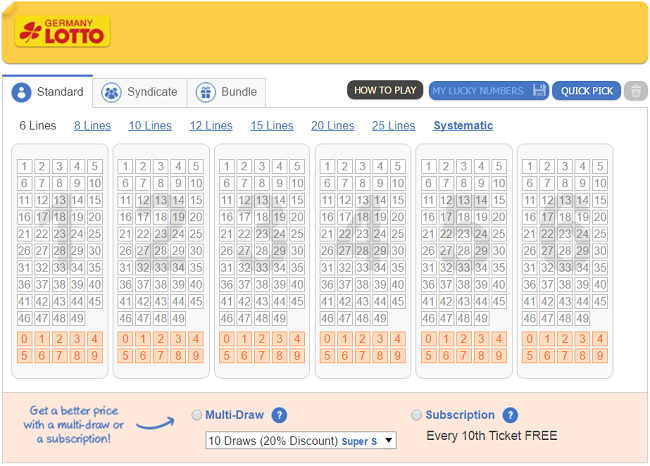 For example, people can purchase a so-called German Lotto multi-draw. It means that they buy a ticket for 10, 25 or even 52 draws in the popular Lotto. A subscription is possible as well. In that case you always receive the 10th ticket for free. A great advantage! Experienced German Lotto players also receive ‘VIP’ points, that gives them a nice discount on Lotto purchases. The Lotto is popular in Germany for a reason. First of all, you can win incredible prizes. It has nine prize divisions in total. You need to have the Super Number for five of them. Without the Super Number the highest prize someone can win is the match 6 second place prize. Second, because of the fact that even the second prizes of the German lottery are incredibly high you can win millions without even having the correct Super Number! The German Lotto offers excellent service and lots of possibilities. For example, on the Lotto site you can see a scan of your ticket online, before the draw takes place. It’s even more exciting when you’ve combined the standard Lotto ticket with the Super Number. The last option sometimes increases prize money even 10 times. It gives you the possibility to win a huge Jackpot, but the other prizes are great as well. Some stories proof that participating in the German Lotto is definitely worth it. For example, a German player who lives in Thailand decided to join the lottery in december 2012. Just a month later, he already won 3978,10 euros! However, this wasn’t enough for him. He decided to play again and work on his lottery strategy. It definitely worked out, because in december 2013 he won 25,805 euros with an 8-number systematic form. Speaking about luck! More information on the FAQ page. The winner from Thailand had to travel to Germany to get his money. Usually prizes are transferred to your account very quickly, because this is simply the way the Lotto works. However, with Jackpot prizes you need to collect it personally. You’ll always receive an email or SMS notification when you’ve won a nice prize. Along with current front-of-shirt sponsor Bet-at-home.com, Lotto Berlin will continue to be one of the Bundesliga club’s two official gambling partners. Its tagline will be visible on pitchside LED bands at Hertha’s home ground, the Olympiastadion, throughout the 2017/18 Bundesliga season. What is the minimum jackpot of the lotto 6 aus 49? In total there are 13 rollovers during every draw. If there’s no Jackpot after this, the amount of money will increase next time. You should definitely try to participate in the weekends as well. During these draws the German Lotto uses a minimum Jackpot of 2 million euros. In the midweek the minimum decreases to 1 million euros, which is also not bad at all! What is the price when you go to buy the ticket in Germany? The game bet for a tip (box) LOTTO 6 out49 is 1.00 € plus one processing fee per game ticket. The game inserts for the additional lotteries amounts to 2.50 € at the game 77 and 1.25 € for a participation at Super 6. The participation in the GlücksSpirale costs 5.00 €. What is the price when you buy online? What is the LOTTO 6 aus 49? The Germany Lottery LOTTO 6 out 49 was first played in 1955 and since then this has been the most popular German lottery. Goal of the game is the prediction of 6 numbers drawn from the numbers 1 to 49 (winning numbers). The draws will be broadcast live on televison or on LOTTO.de on Wednesday at 6:25 pm and on Saturday at 7:25 pm.